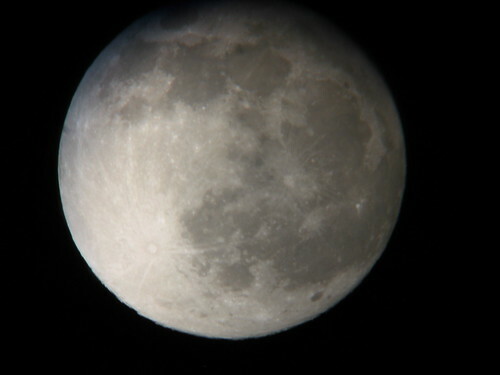 Tonight—August 31, 2012— is the second full Moon of August. The last time two full Moons occurred in the same month was in 2010, and the next will be in 2015, so while the events are rare, they aren't terribly uncommon either. In fact, you've probably heard the second full Moon given a name: "blue moon". (The Moon will not appear to be a blue color, though, cool as that would be. More on that in a bit.) What you may not know is that this term dates back only to 1946, and is actually a mistake. According to Sky and Telescope, a premiere astronomy magazine (check your local library! ), the writer James Hugh Pruett made an incorrect assumption about the use of the term "blue moon" in his March 1946 article. His source was the Maine Farmers' Almanac, but he misinterpreted it. The almanac used "blue moon" to refer to the rare occasion when four full Moons happen in one season, when there are usually only three. By the almanac's standards, tonight's full moon is not a blue moon (though there will be one on August 21, 2013). However, even that definition of "blue moon" apparently only dates to the early 19th century. In its colloquial, non-astronomical sense, a "blue moon" is something that rarely or never happens: like the Moon appearing blue. The Moon is white and gray when it's high in the sky, and can appear very red, orange, or yellow near the horizon for the same reason the Sun does. As far as I can tell, the only time the Moon appears blue is when there's a lot of volcanic ash in the air, also a rare event (thankfully) for most of the world. The popular song "Blue Moon" (written by everyone's favorite gay misanthrope, Lorenz Hart) uses "blue" to mean sad, rather than rare. I'm perfectly happy to keep the common mistaken usage of "blue moon" around, though, since it's not really a big deal to me. Call tonight's full Moon a blue moon, and I'll back you up. However, because it's me, let's talk about the Moon and the Sun and why this stuff is kind of arbitrary. A problem arises when you try to break the year into smaller pieces. Traditionally, this has been done through reference to the Moon's phases. The time to cycle through all the phases of the Moon is called a lunation, which is about 29 days, 12 hours, 44 minutes, and 3 seconds long. You don't need to pull out a calculator to realize that a lunation doesn't divide into a year evenly, but it's still a reasonable way to mark the passage of time within a year, so it's the foundation of the month (or moonth). Another resolution to the problem of lunations vs. Sun is to ignore the Sun; this is what the Islamic calendar does. Months are defined by lunations, and the year is precisely 12 months, meaning the year in this calendar is 354 or 355 days long. This is why the holy month of Ramadan moves throughout the Gregorian year, happening sometimes in summer, and sometimes in winter. The Gregorian calendar does things oppositely to the Islamic calendar: while months are defined, they are not based on a lunation at all. Months may be 30 days long (roughly one lunation), 31 days, or 28 days; the latter two options make no astronomical sense at all. Solar-only calendars have some advantages: since seasons are defined relative to the Sun, the equinoxes and solstices happen roughly on the same date every year, which doesn't happen in lunation-based calendars. It's all a matter of taste, culture, and convenience, however, since the cycles of Sun and the Moon don't cooperate with the length of the day on Earth, or with each other. Blue moons in the common post-1946 usage never happen in lunation-based calendar systems because by definition each phase of the Moon only occurs once in a month. On the other hand, the version from the Maine Farmers' Almanac is relevant to any calendar system, because it's defined by the seasons. As I wrote in my earlier DXS post, seasons are defined by the orbit of Earth around the Sun, and the relative orientation of Earth's axis. Thus, summer is the same number of days whatever calendar system you use, even though it may not always be the same number of months. In a typical season, there will be three full Moons, but because of the mismatch between lunations and the time between equinoxes and solstices, some rare seasons may have four full Moons. The Moon and Sun have provided patterns for human life and culture, metaphors for poetry and drama, and of course lots of superstition and pseudoscience. However, one thing most people can agree upon: the full Moon, blue or not, is a thing of beauty. If you can, go out tonight and have a look at it—and give it a wink in honor of the first human to set foot on it, Neil Armstrong.